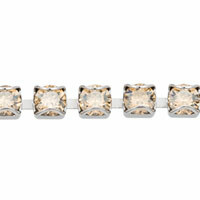 Create a zigzag with the WireLuxe by pulling on each side at an angle in opposite directions. The zigzag will shorten the length. You can create a freeform zigzag if you like, but for a consistent pattern, create a “peak” every ¾” by pulling at every inch in the opposite direction. The zigzag will shorten the length about 1/4 inch per pull so you will have a complete zigzag about every 1 ½ inches. You can undo the zigzag by simply reversing the direction pulled – so if you don’t like the shape, simply adjust it as desired. WireLuxe is very study and can take being zigzagged and re-zigzagged. ( Of course, do this before you press it with wire smoothers in Step C below). With the fingers on your right hand hold the end of the right side of the WireLuxe edge, and the fingers of your left hand hold the left edge 1 1/4” inch in from the end, pull both sides at an angle in opposite directions. Release your right-hand fingers only and move them one inch past the left-hand fingers and repeat pulling in the opposite direction. Now release the left hand and move it one inch past the right and pull in the opposite directions. Continue alternating fingers, pulling the zigzags to the length needed. With wire smoothers, press/squeeze along the edges to set the zigzag — as if you were pressing a crease into pants. Open the smoothers and move them before pressing each section. If you slide the smoothers along the edge, you will pull out the zigzags. 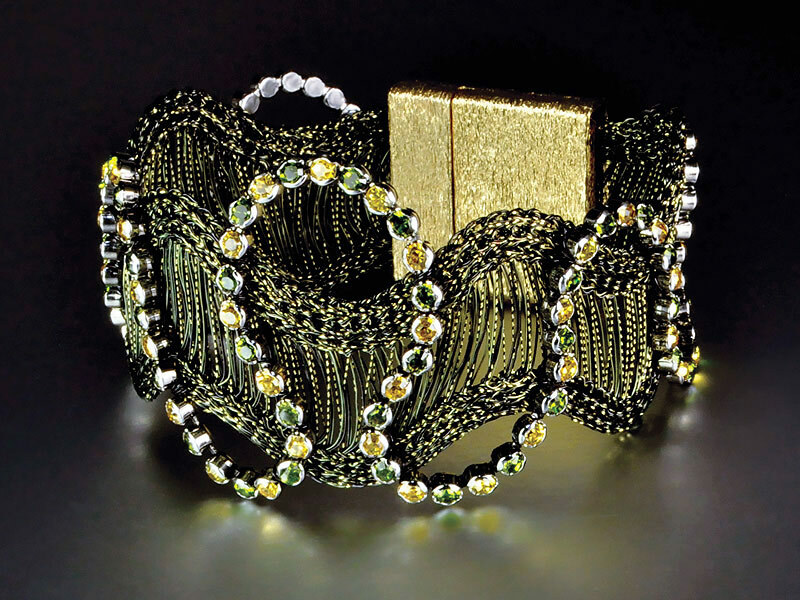 After the zigzag pattern is complete, cut the WireLuxe the final desired bracelet length (Note: it may end up slightly longer - about 1/16” - than you cut it due to the zigzag). 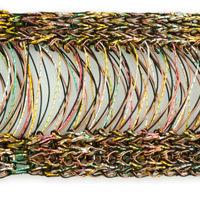 For example: for a 7½-inch finished bracelet, cut the zigzagged WireLuxe at the 7½-inch mark. (If you’re not sure about the fit go to Step 3 and complete only one end, test fit the length by wrapping it around your wrist and then cut the other end and proceed as instructed). Fold the edges on both ends over ¼ inch and squeeze flat with the wire smoothers or chain nose pliers (Fig 3). Test to see if the folded edges fit in the clasp by fully inserting the edge into the clasp cavity. If it doesn’t fit, flatten the edge further. (Optional: use a chalk pencil on the WireLuxe to draw along the along the clasp edge so you know where the chain can begin.) This is also a good time to test or retest the fit. If it’s too short, simply pull slightly on each end to lengthen. If it’s too long, either trim and refold one end OR pull the peaks gently to exaggerate the zigzag and reduce the length. Remove the WireLuxe from the clasp and trim any WireLuxe threads that would stick out around the clasp once it is permanently attached. FREEFORM: Arrange the chain so you know the approximate design. Sew the chain on one end and design as you go taking care that your chain will extend the full length needed. To ensure your chain doesn’t run short, sew the chain on the other end with a basting stitch or simply start with a longer chain than you think you’ll need. GLUE Tacking: Use removable ½” glue dots (these come on a roll and available at most art or craft stores) and simply stick them where you want the chain to gently hold in place. When you get to the spot where you want to sew lift up the chain to remove the glue dot and keep sewing. Use the glue dot flat or roll it with your fingers into a sausage shape – the added depth holds the chain more securely while you’re working. SEW Tacking: Sew a temporary stitch in the areas you want the chain to attach and remove after (or as) you add the final stitching. Don’t create an anchor knot or finishing knot and use a different color thread to make removal easier to see. Thread the needle with about one yard (36 inches) of thread. Center the needle on the thread and knot the ends together to double it (18 inches). You can start stitching on either end and either edge of the WireLuxe. Insert the needle into the folded end of the WireLuxe. Go back through the loop of the thread knot to anchor it. Insert the needle back into the folded end of the WireLuxe and run the needle inside the edge (to hide it) coming out in ½ inch. Stitch the chain to the WireLuxe only where it overlaps the banded edges — not in the striated center area. Begin attaching chain by stitching twice between the first and second link. Stitch again between the second and third link and any other links that fall on the WireLuxe edge. Stitch along one edge, hiding the thread in the WireLuxe edge between each stitched chain segment. When you reach the end of one side of the WireLuxe, knot the thread into the crease of the folded edge. Trim the thread. Rethread the needle and repeat on the other edge. If you have enough when you finish the first side, you can run the thread through the folded edge and begin stitching back down the other side, adjusting the chain as necessary to achieve the desired effect. Never cross the thread over the center of the WireLuxe or it will be visible through the striated area. 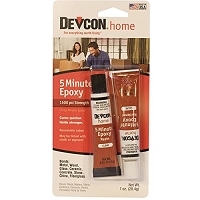 Mix two-part epoxy according to package directions and fully line the inside of the clasp cavity (don’t fill it). Spread epoxy along the WireLuxe’s folded edge. 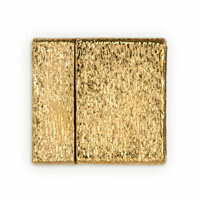 Push the WireLuxe into one half of the clasp and wipe off any glue that seeps out. Check the inside of the clasp (where the magnet is) and wipe off any glue that seeped out of the tiny hole. Repeat on other side and let it dry completely. Enjoy your new Serpentine WireLuxe Bracelet!